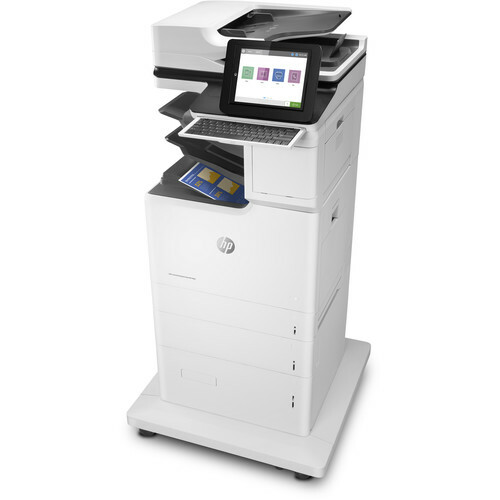 Designed for demanding workplaces, the Color LaserJet Enterprise M682z All-In-One Laser Printer from HP takes things up a notch with exceptional security, outstanding print features, and multi-functional capabilities including scanning, copying, and faxing that will make this machine the only one you will need for your essential office needs. This model can produce detailed black and color documents at up to 1200 x 1200 dpi and can even reach speeds of up to 60 ppm for maximum productivity. It also works with a variety of media up to 8.5 x 14" and can perform automatic duplexing for 2-sided printing. For scanning, the M682z uses a CCD sensor with either the 8.75 x 14.38" flatbed or a 150-sheet ADF capable of handling media up to 8.5 x 34" in size. Scans also benefit from an optical resolution of 600 dpi. For general media handling users have access to a 100-sheet multipurpose tray, two 550-sheet input trays, and one 2000-sheet high-capacity feeder. Also, there is a 500-sheet stapler/stacker for organizing your documents as they are created. For operation, there is a large 8" CGD touchscreen as well as a pull-out keyboard for intuitive control and easy data entry. An easy-access USB port is available as well for direct printing and scanning while Wi-Fi and Bluetooth Low Energy connections can be set up for wireless interfacing from a variety of devices. Additionally, both USB 2.0 and Ethernet can be used for wired setups. Print resolutions are available at up to 1200 x 1200 dpi in color and black. Users can print at speeds up to 60 ppm. First print out time of 5.7 seconds. Automatic duplexing for 2-sided prints. Mobile printing capabilities include Apple AirPrint, Google Cloud Print 2.0, HP ePrint, Mopria, Bluetooth Low Energy, and Wi-Fi Direct. Standard print language of HP PCL 6, HP PCL 5c, HP PostScript Level 3 emulation, native PDF v1.7, and URF. A 100-sheet multipurpose tray, two 550-sheet trays, and one 2000-sheet high-capacity tray are present for versatile media handling and for working with large print jobs. Supported media types include plain paper, photo paper, thick paper, recycled paper, and more. A 3-bin stapler/stacker with offset job printing can be used to sort and staple your documents as they are made. Monthly duty cycle of 120,000 pages with a recommended monthly volume of 2000-17,000 pages. Uses a Charge Coupled Device (CCD) with an optical resolution of 1200 dpi. Both an 8.75 x 14.38" flatbed and 150-sheet automatic document feeder are available for scanning. The ADF can handle documents from 2.7 x 5.8" up to 8.5 x 34" in size. The scanner has a hardware resolution of 600 x 600 dpi and can scan at speed up to 90 ppm or duplex at up to 180 ipm. Scanning benefits from a color depth of 24-bit and a grayscale depth of 8-bit or 256 levels. Scanning can be performed at speeds up to 90 ppm, or 180 ipm with duplexing. Native scan file formats include PF, JPG, TIF, and MTIF. Digital sending features include scan to email, save to network folder, save to USB drive, send to Sharepoint, send to FTP, send to LAN fax, send to Internet fax, local address book, SMTP over SSL, blank page removal, edge erase, auto color sense, auto crop to content, compact PDF, auto tonescale, auto orientation, multi-pick detect, auto straighten, auto crop to page, and OCR. Advanced scanner features include optimize text/picture, image adjustments, job build, output quality setting, selectable scan resolution from 75-600 dpi, auto detect color, edge erase, job notification, blank page suppression, HP Quick Sets, HP EveryPage, auto orientation, embedded OCR, auto crop to page, and auto-tone. Copy resolutions of up to 600 dpi are available in both black and color. Copies can be made at speeds of up to 60 cpm in black and color. Up to 9999 copies can be made at a time. Copy settings include two-sided copying, scalability, image adjustments (darkness, contrast, background cleanup, sharpness), N-up, N or Z-ordering, content orientation, collation, booklet, job build, edge-to-edge, job storage, ID Copy, Book Copy, and A-to-B Copy (different media sizes). Fax machine uses a 33.6 kbps modem to transmit one page in approximately 3 seconds. Fax resolutions of 300 x 300 dpi, or 400 x 400 dpi for received faxes, and 203 x 98 dpi are available. Internal fax memory for about 500 pages. Capacity for up to 1000 speed dial numbers, each with 210 destinations. Fax features include auto fax reduction support, auto-redialing, fax forwarding, fax polling, junk barrier, and PC interface support. Smart features include stored faxes, fax archiving, fax forwarding, scale to fit, fax address book, LAN/Internet fax, fax number confirmation, and holiday fax schedule. USB 2.0, Ethernet, Wi-Fi, and Bluetooth Low Energy connectivity are available, as well as one RJ11 port for the fax function. A large, tilting 8" CGD touchscreen is available for intuitive control over settings alongside a pull-out keyboard and home button. An easy-access USB port is available for printing from and scanning to a portable storage device. HP Sure Start automatically checks the printer's operating code and repairs itself to help prevent hacks. Run-time intrusion detection monitors to detect and stop attacks and will then automatically reboot the unit. HP Web Jetadmin provides centralized control over your print network. ColorSphere3 toner and an automatic media sensor ensure optimized quality. A Hardware Integration Port is available for expanding functionality of the printer. Standard memory includes 1.5 GB for the printer and 1 GB for the scanner with an optional maximum of 3 GB. A 320 GB HP High-Performance Secure Hard Disk with AES 256 hardware encryption or better is available to safeguard your data. A multitude of security management tools are available to help protect your network and data. Wake-up time of just 12.5 seconds. Built-in fonts and typefaces include 105 TrueType fonts, 92 scalable PostScript fonts, one Unicode font, two Windows Vista 8 fonts, and more. ENERGY STAR, Blue Angel, CECP, and EPEAT Silver qualified. Box Dimensions (LxWxH) 61.0 x 33.0 x 29.0"